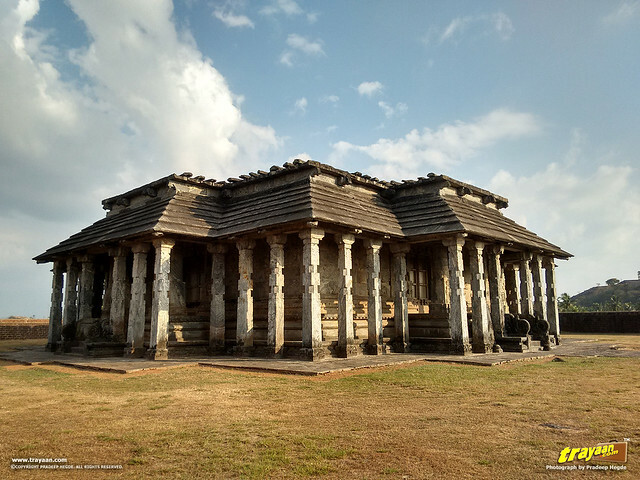 Karkala, a town in Udupi district in Karnataka is home to several historical and significant Jain temples or basadis which are hundreds of years old, with the architecturally prominent and unique Chaturmukha Basadi, the four-faced symmetrical Jain Temple. Karkala is a town in Udupi district of Karnataka state. 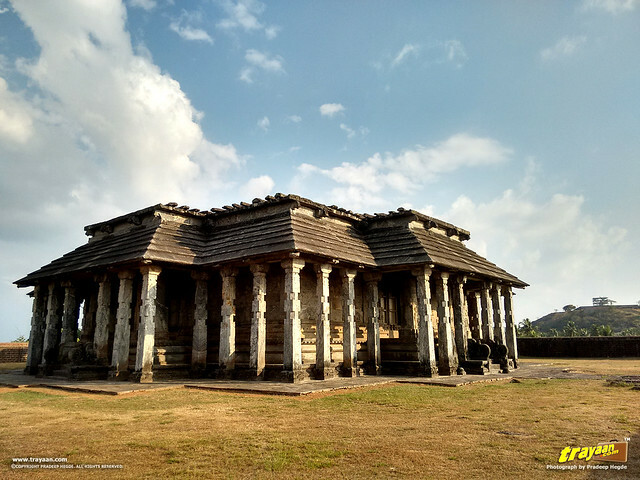 Many historical structures stand in Karkala as wonderful examples of art and architecture. 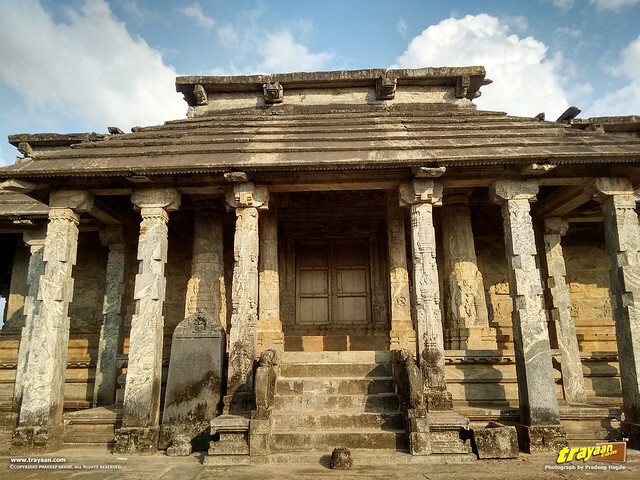 Some of them are now protected by the Archaeological Survey of India (ASI), like the Ananthapadmanabha temple, built in 1567 CE, the Chathurmukha Basadi, The monolith of Lord Bahubali Gommateshwara and the Manasthamba at Hiriyangadi. 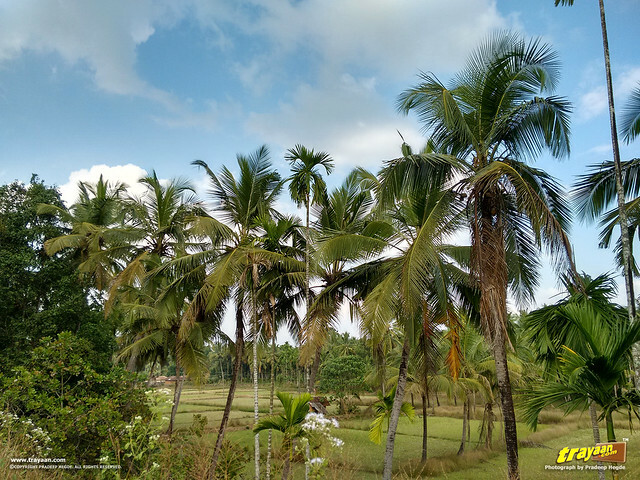 These are just some of the places to see in Karkala. Its anglicised name was Karkal. 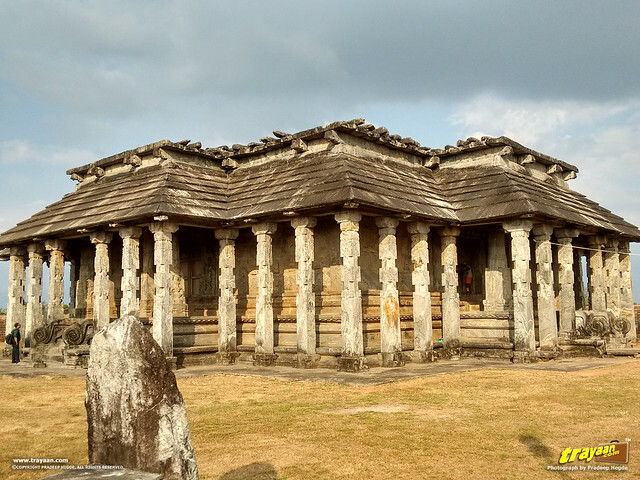 Karkala is also home to several hundreds of years old Jain and Hindu Temples that stand to date as an evidence of a rich and diverse cultural history of Coastal Karnataka and surrounding regions. Karkala is one of the places worth visiting if you happen to be at Udupi or Mangalore (now renamed as Mangaluru) on a tour. Basadi means a Jain shrine or temple. 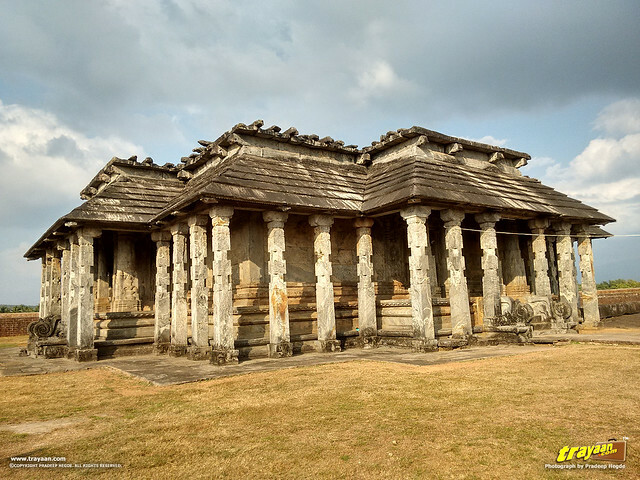 Known as Pandya Nagari in the ancient times, later known as Karikallu (Black stone), Karkala appears to have been under the Alupas, the feudatories of the Kadambas in 6th century CE. The Kalasa-Karkala kingdom was established by the Bhairarasa Odeyas spanning from 13th to 16th century CE. Karkala gained political and cultural importance during this time. 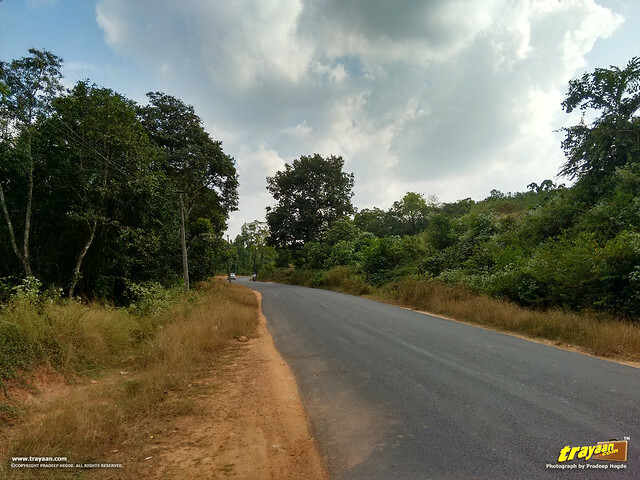 Taking a ride from Udupi, with lush green surroundings along the road, we reached Karkala. Away from the hustle bustle of the big cities, a drive through the greenery is always refreshing. 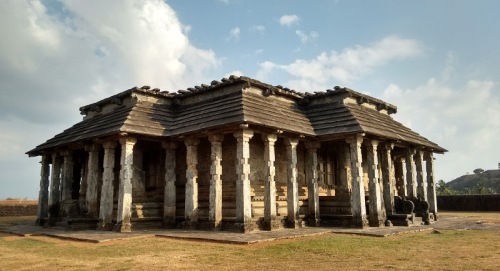 The first place we saw was a Digambar Jain Basadi, situated in the Aane kere lake of Karkala, visible passing by the main road through the Karkala town. Aane kere in Kannada means elephant lake (aane=elephant, kere=a small lake in Kannada)(Also spelt as ane kere). 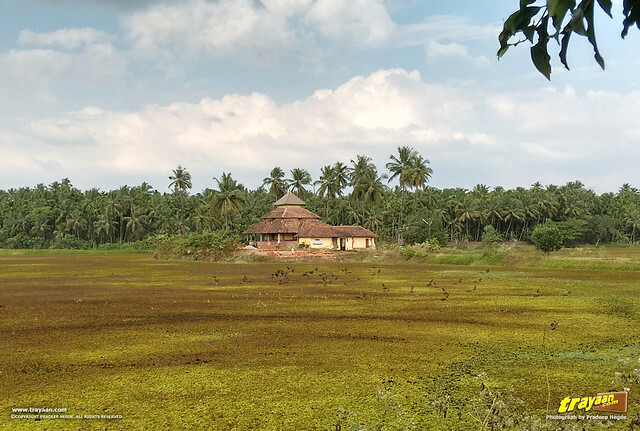 This historic lake and the basadi situated in the midst was built by King Pandya VI and said to have supported Karkala with drinking water for centuries. As the kings elephants used to bath here, it got its name as Aane kere. Now, the water is covered completely by some kind of water plants or weeds over the lake, spoiling the look. What looks like a supposed to be park or garden in the front of the lake is not maintained. If properly utilized, this can be turned into a popular tourist spot. 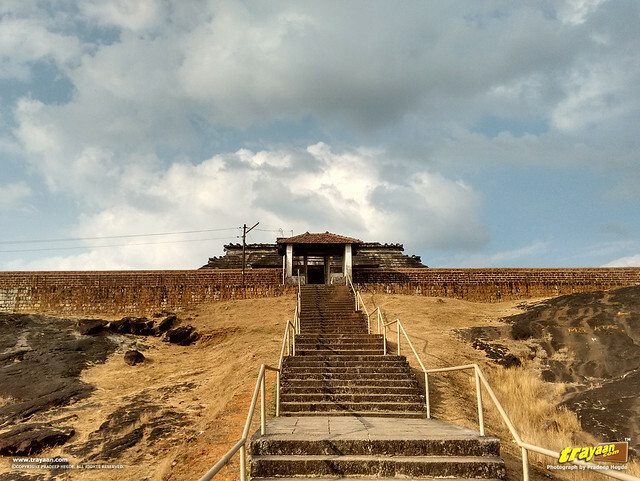 Kere Basadi is located in the middle of Anekere lake with the 1st Jain Tirthankar Lord Adinath as the main diety. 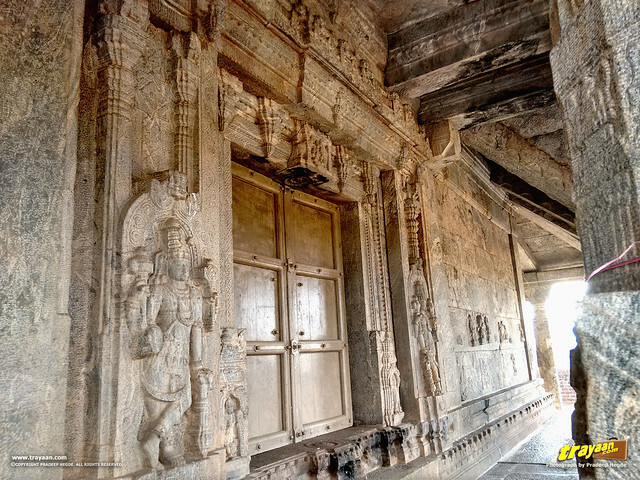 It is also a Chaturmukha Basadi, i.e., it has idols and doors on all the four sides. Anekere features various birds , and you may love it if you are into bird watching and photographing birds. We saw a flock of birds over the lake during our visit. Alas, we aren't such experts in birds to tell you more about them ourselves! Ramasamudra lake is another lake in Karkala, said to be built by Veera Bhairava in the memory of his dead son Ramanatha.We had to skip it due to shortage of time, but we visited there during our next trip to Karkala. 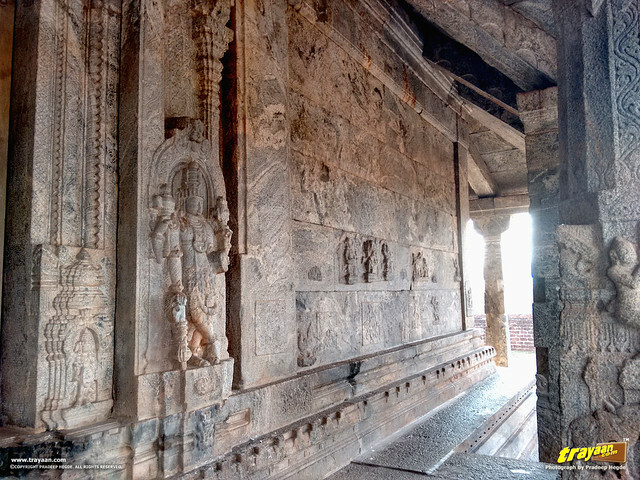 Also See : Kere Basadi - The Lake Temple of Varanga, which is also a Chaturumukha Basadi. 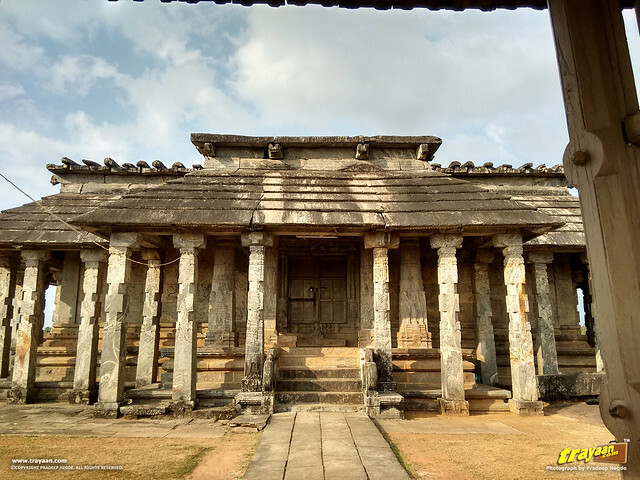 The most prominent and architecturally significant Jain temple or basadi of Karkala is the Tribhuvana Tilaka Jina Chaityalaya or Ratnatraya dhama (according to inscriptions), which is polularly known as the “Chaturmukha Basadi”, which means a basadi, or temple with four faces. When someone refers to Chaturmukha Basadi of Karkala, this is it. On seeing it, you will know how obviously it got this name. 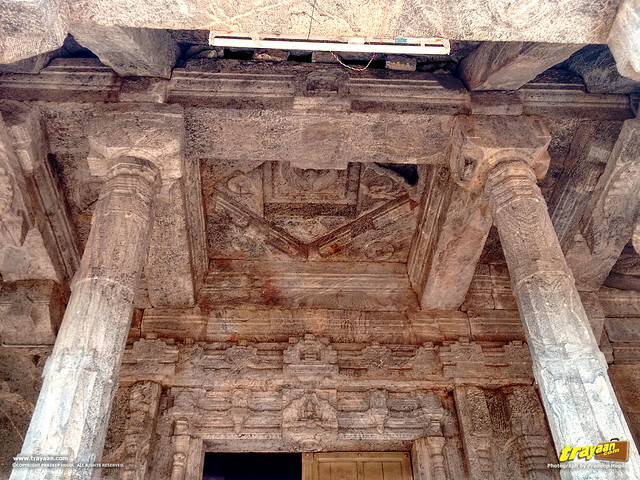 The Chaturmukha Basadi has four identical looking sides and entrances from the four directions (north, east, south and west) to the main sanctum, hence the name. Chaturmukha means four-faced. 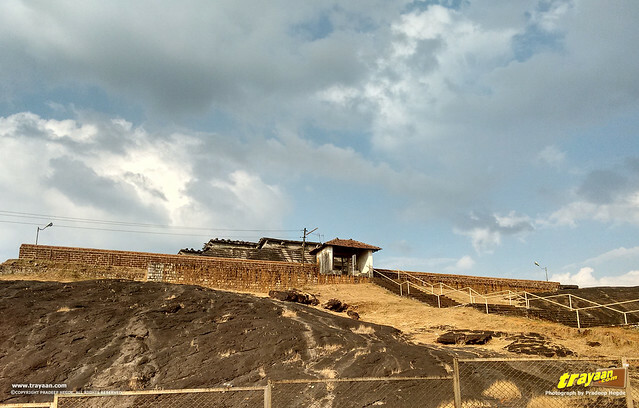 The Chaturmukha basadi , completely made of carved granite rocks stands on top of a rocky hillock. 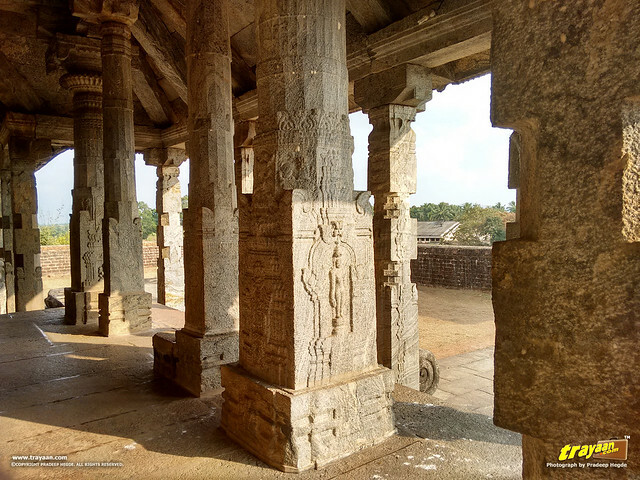 It was built around 1586 CE by Bhairavendra II, the ruler of Kalasa-Karkala. The roof is flat. It is surrounded by a high raised and narrow corridor or a plinth with pillars outside from the ground level supporting the roof and shades, like a colonnade surrounding the temple. The portico, or the extended area of the plinth at the four entrances and steps, have slanted stone shades and roof which are supported by more pillars. 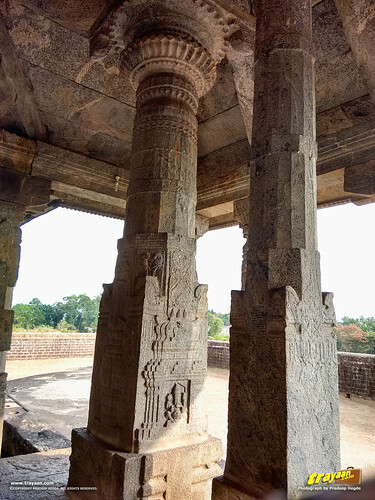 Similar slanted stone shades are typically seen in most of the Jain temples, and also some of the old Hindu temples of the Coastal Karnataka region. 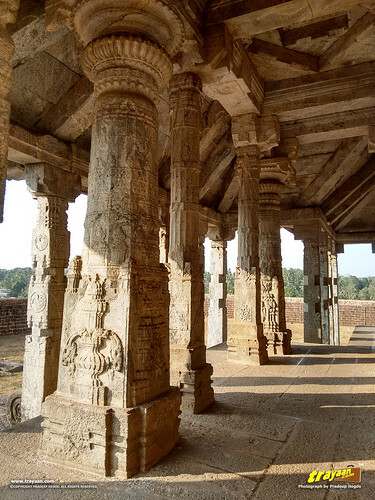 For other examples of these slanted stone shades, see Thousand Pillared Jain Temple of Moodabidri and Chaulikeri Ganapathi Temple of Barkur. Each pillar of the outer colonnade is monolithic, that is, carved out of a single stone. 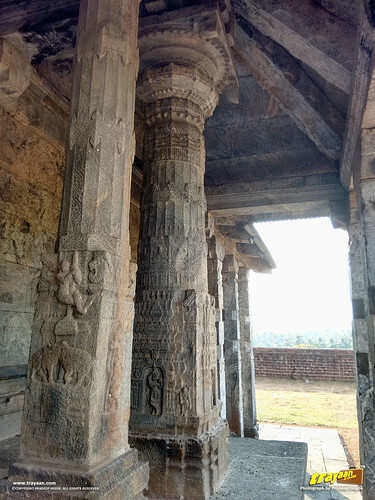 These pillars are about 18 feet in height and have simple styled carvings which are commonly found in many temples. 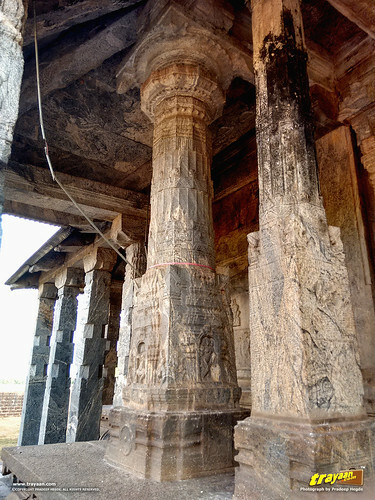 The pillars that stand on the raised platform or the plinth, in the portico before all the four entrances are carved beautifully with the bas-relief images of Jain and Hindu deities. 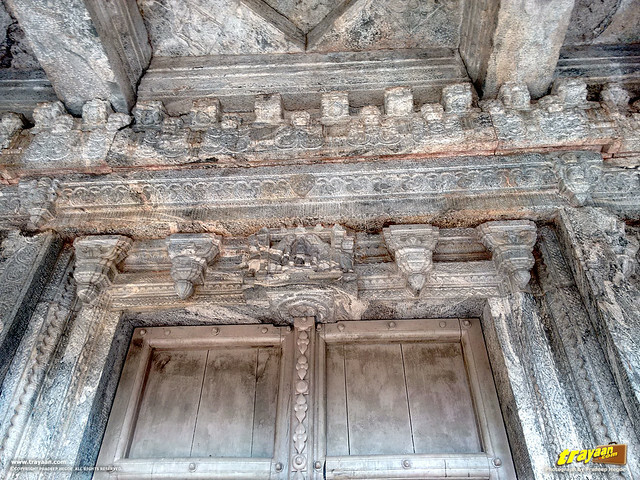 The walls, doorways also have bas-relief carvings. 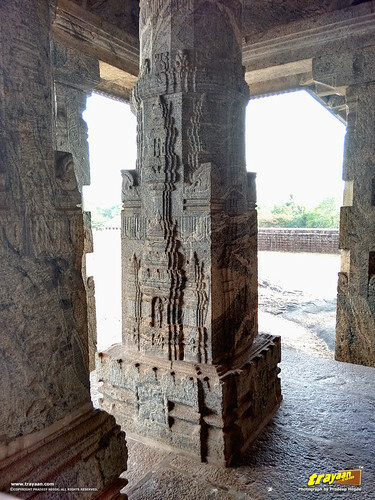 Even though not as ornate as other temple architectures like the Hoysala or Vijayanagara styles, the Chaturmukha basadi is a spectacular architecture completely made out of stone. Usually the Hindu and Jain temples have a main entrance, facing the main sanctum housing the main deity, with the main deity facing the direction of the main entrance. There may be other side entrances or exits also. In almost all Hindu temples, the idol of the deity will be placed in the west end; facing east, the direction of the rising sun, with the main entrance given at the east side. Most of the Jain temples of the region follow this, with the exception that the main entrance may not always be towards east, and the main deity may not always be placed at the western side of the sanctum, facing towards east. 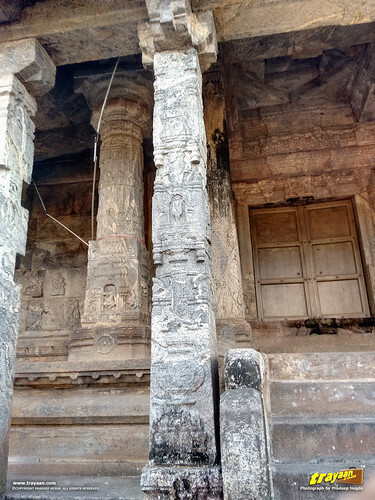 But in the Chaturmukha Basadi, all the four entrances in four directions are of identical size and shape, with the carvings on them the only possible variation. Inside the main sanctum, there are life-size idols of the Tirthankaras which are carved out of black stone facing all the four doors in four directions. 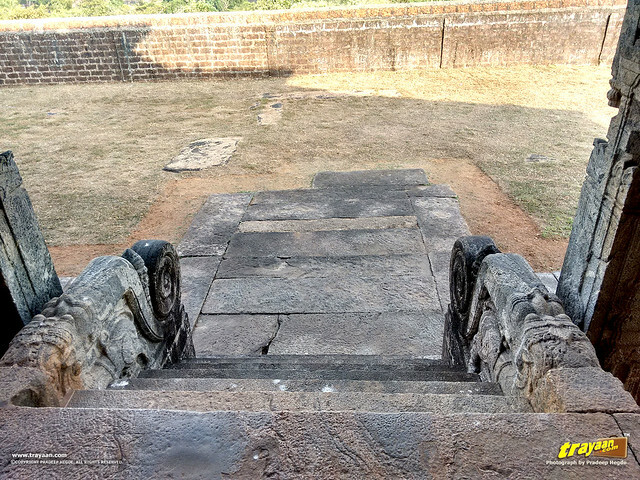 Through the southern door, you can see the Gomatagiri, the hill on which the monolithic Gomateshwara statue is established. 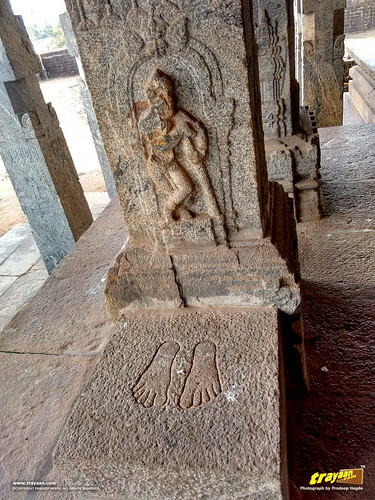 This four faced “chaturmukha” style can be seen in other Jain temples in Karnataka, such as the Ane kere Basadi in Karkala town itself - mentioned above, the Kere basadi Lake Temple at Varanga, and the Chaturmukha basadi at Gerusoppa. There may be more that we don’t know of yet. 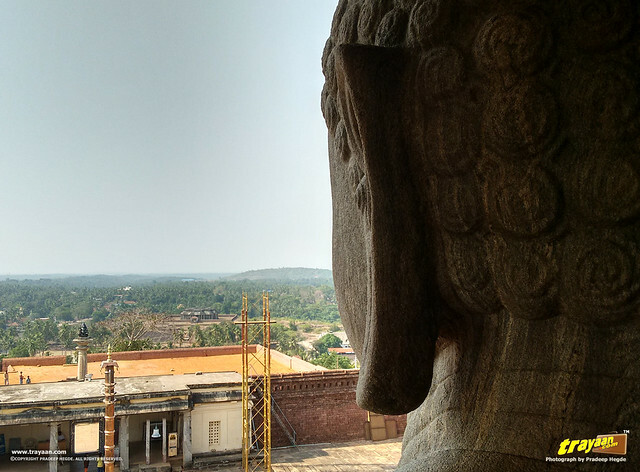 The Gomateshwara hill is nearby, featuring the 12.8 metre tall or ~42 feet high monolithic statue of Lord Bahubali, well known as Gomateshwara. 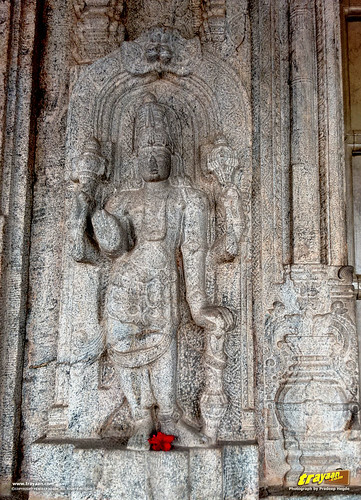 This is one of the five monoliths of Gomateshwara in Karnataka. 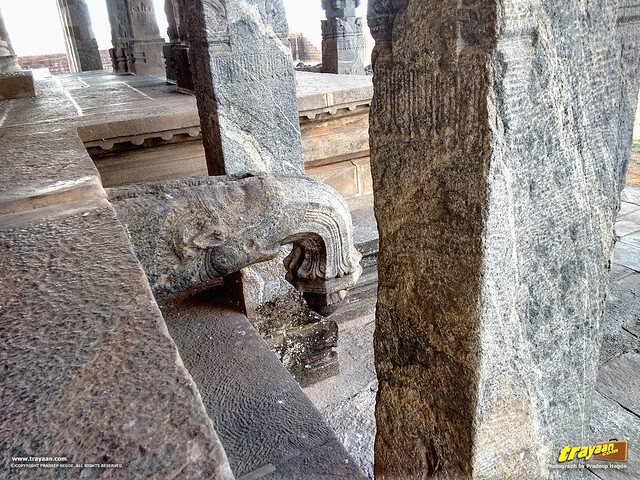 The largest one is at Shravanabelagola. Others are at Dharmasthala, Venur, and Gommatagiri (near Mysore). At the time of our visit, the statue was surrounded by temporary structure for the Mahamastakabhisheka, which took place towards the end of January this year. This ceremony is held every twelve years, where the statue is bathed and anointed with milk, water, saffron, etc. 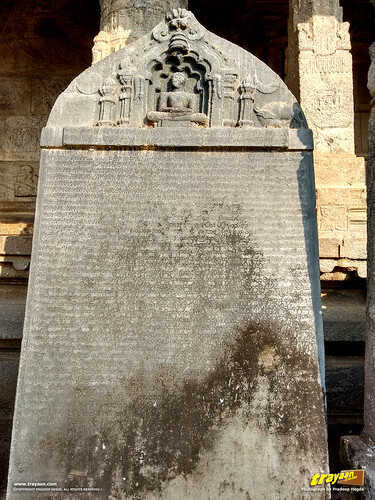 The Bahubali monolith of Karkala, situated on a rocky hill, was erected by king Virapandya of Kalasa-Karkala kingdom in 1432 CE. 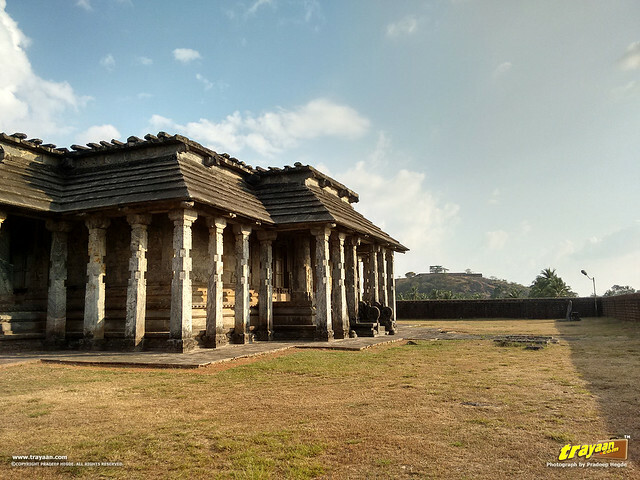 Karkala is a culturally rich place with several historically significant monuments, and a serene environment. It has all the potential to be a popular tourist destination. The Venkataramana temple, popularly known as “Padutirupathi", meaning West Tirupathi, built in 1537 CE. The Veeramaruti temple, originally built in 1539 CE, featuring over 15 feet idol of Lord Hanuman. 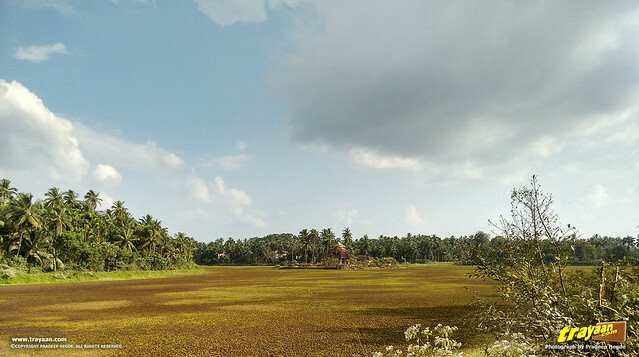 Varanga (~24 Kilometres from Karkala town) - An idyllic village which is home to the 850 year old Kere Basadi (Lake temple) and the Neminatha Basadi, a 1200 year old Jain Temple. There are a good number of buses that ply to Karkala from Mangalore, Udupi etc. Hiring a cab or some 4 wheeler is a good option, as you can easily cover other nearby places of attractions worth visiting. 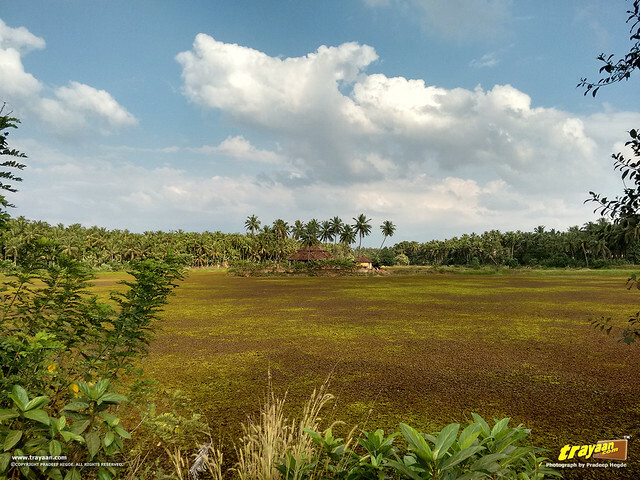 If you are visiting Mangaluru or Udupi, then Karkala is well within a day trip. Nearby Moodabidri can also be covered. Karkala is about 17 kms from Moodabidri, 51 kms from Mangalore (Mangaluru) , 37 kms from Udupi via Moodulbelle & 40 kms from Udupi via Manipal-Hiriadka road, 58 kms from Sringeri. Also, Agumbe is ~49 kms ; Venur is ~ 36 kms and Barkur is ~ 49 kms from Karkala. See below map for various routes and directions. There are a few decent places to have food in the town. There aren't much great hotels or lodges in Karkala. However, one can stay in Udupi or Mangaluru, and then travel to Karkala covering other significant places along. During the winter, between October to February or March, before the summer heat begins. It gets extremely hot and humid during summer (March/April to May/June). If you simply love the monsoon rains, go ahead in rainy season (around June to September). But keep an eye on the weather in the rainy season, as the roads this time may be bad. Moodabidri - Featuring the Thousand Pillared Jain Temple (Saavira Kambada Basadi), and other historical Jain temples. 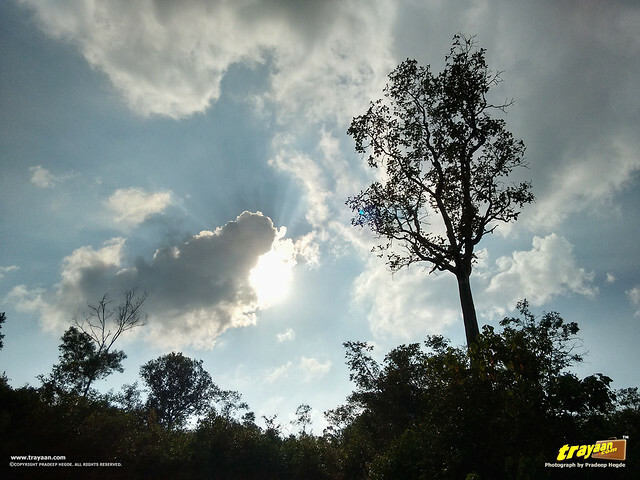 Agumbe – The sunset view point in Agumbe at an elevation of 643 m (2,110 ft) is a very popular spot in Shimoga district. Udupi town and district features the famed sri Krishna temple and other temples, St.Mary's island, an ideal picnic spot, and many more.